Oakura Bay Villa is a truly unique property on Waiheke Island. Located on its own private beach, this beautifully restored original Kauri Villa is perfect for a holiday with family and friends. The property encompasses 5 hectares and includes four private islands, a small vineyard, and 1.7 kilometres of stunning coastline to explore! Row boats, kayaks and plenty of flat land for family picnics or lawn games plus safe swimming, snorkelling and fishing are all just out the front door.The villa features wrap around covered decks, outdoor seating, a BBQ area, outdoor shower and a magnificent old fashioned porch swing for guests of all ages to enjoy. The fully equipped 1970's spacious kitchen has a large dining table and direct access to the covered outdoor lounge and sun room. The main lounge faces out to sea and is home to a large flat screen TV with DVD player, books and games for night time enjoyment and/or the odd rainy day. The master bedroom (with lovely beach/sea views) has a super king bed, the second bedroom has a double bed and there is a king bed and two single beds in the third bedroom. The conservatory, located off the kitchen, will sleep an additional two guests in single beds and the villa has two brand new bathrooms. Rich with history and filled with love, Oakura Bay Villa will take you back in time to sea side holidays of years past and create family memories to last a lifetime. 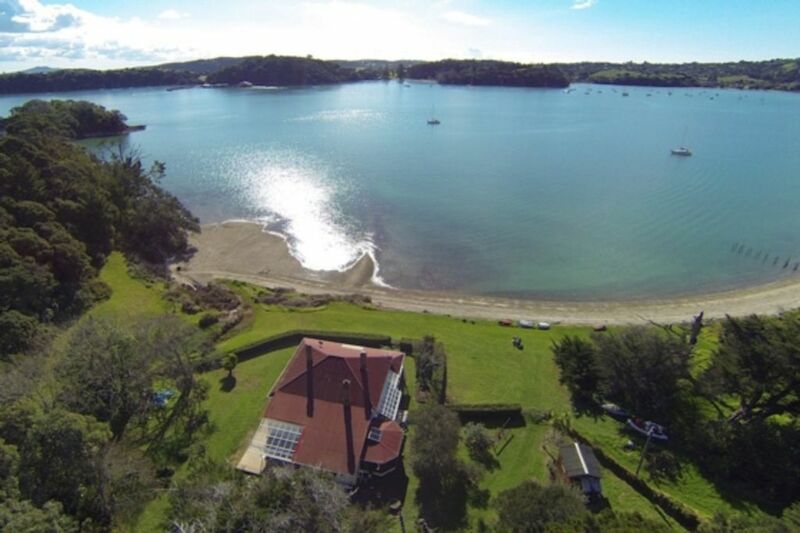 The property is central to Waiheke's award winning vineyards and restaurants, the white sands of beautiful Onetangi beach, 240 hectare Whakanewha regional park and amazing walking trails. The car ferry, petrol station and a large supermarket are within 10 to 15 minutes drive from the property. Close to award winning vineyards and restaurants. This is our second stay and we're booked again in January. Its a special house, makes you feel relaxed immediately and the grounds and private beach are brilliant, especially for our dogs who are fascinated if a little freaked by the many rabbits around! Not as luxurious as some holiday homes and outdoor furniture (cushions) may need a spring clean, but still my favourite home from home. Kayaks are a plus as well - can't wait to return. This was an absolutely superb location and the property itself is delightful, inside and out. This was an absolutely superb location and the property itself is delightful, inside and out. The kitchen is extremely well kitted out, with more than adequate implements and pans, and the bedrooms and sitting areas are great. Amazing old Bach, very cool location. Amazing old Bach, very cool location. Stunning beach walks. Beware of the unfriendly groundskeeper up on the hill, don't stray too far from the property! Also we got charged part of our bond for cleaning of excessive dog hair, although property rental states ok to have pets. Don't even think of building a fire on the beach, you'll get a call asking you not to. It's the rules. Read the rules! Good internet coverage in the house. Heaters in each room. A great summer or winter getaway. Thank you for staying! I apologise if the gardener was grumpy.. he's actually a lovely man. We do allow dogs at Oakura upon application as we understand how nice it is for people to be able to bring their pets. The cleaning fee charged is a standard fee for all guests. We will charge an additional clean fee if extra time required due to pet hair or if the garden is not cleared of pet waste. In this case the fee was $60. Fires are strictly prohibited on beaches on Waiheke due to fire risk. From the moment of arrival you know that you are in a special place. From the moment of arrival you know that you are in a special place. Stunning house and surrounds and everything is geared towards your comfort. Well equipped kitchen and plenty of good toiletries. We had a perfect relaxed weekend and it wouldn’t have been the same without our 2 dogs, so thank you for being dog friendly. We will definitely return as we left a piece of our hearts at Oakura Bay Villa. Such a great place and peaceful, cant wait to go back ! Such a great place and peaceful, cant wait to go back ! !